Spotify arrives on Logitech Squeezebox | What Hi-Fi? 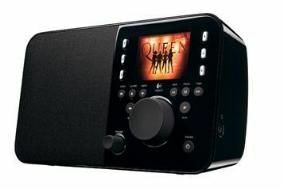 Using an existing wi-fi home network and a Squeezebox Touch or Squeezebox Radio, owners can access Spotify's comprehensive catalogue of more than ten milion songs, plus playlists, anywhere in the home. You'll need a Spotify Premium subscription, which gives you the added benefit of higher-quality 320Kbps sound, online and mobile access and some exclusive music content. "Whatever music you like, from wherever in the world, Spotify and Squeezebox make it even easier for you to sit back, listen and relax in any room in your home," says Romain Du Gardier, senior product manager for Logitech EMEA. A fully featured test version of the Spotify app for Squeezebox is available now from MySqueezebox.com, prior to a full rollout expected in the near future. Spotify is currently available in Finland, France, the Netherlands, Norway, Spain, Sweden and the UK. For more details about the Beta version and how to install it, go to: www.mysqueezebox.com/spotify.